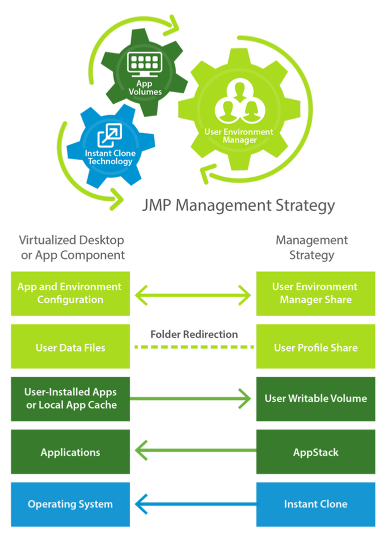 The JMP approach provides several key benefits, including simplified desktop and RDSH image management, faster delivery and maintenance of applications, and elimination of the need to manage “full persistent” desktops. 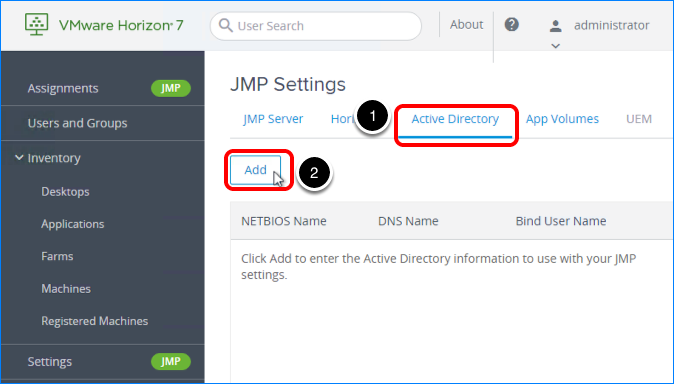 JMP is supported with both on-premises and cloud-based Horizon 7 deployments, providing a unified and consistent management platform regardless of your deployment topology. 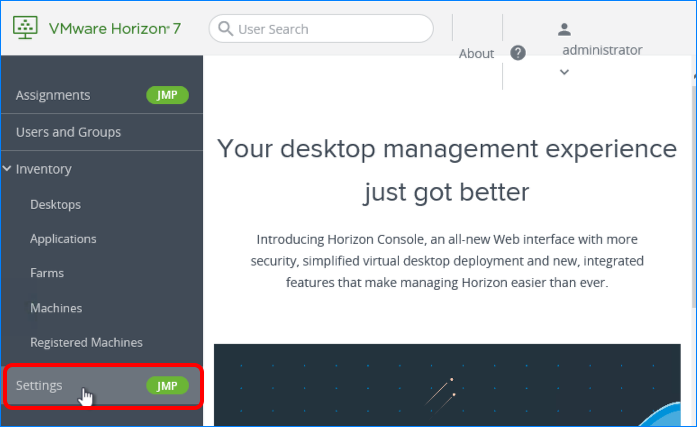 With the Horizon Console and the VMware Horizon JMP Integrated Workflow features, you can use a single console to define and manage desktop workspaces for users or group of users. 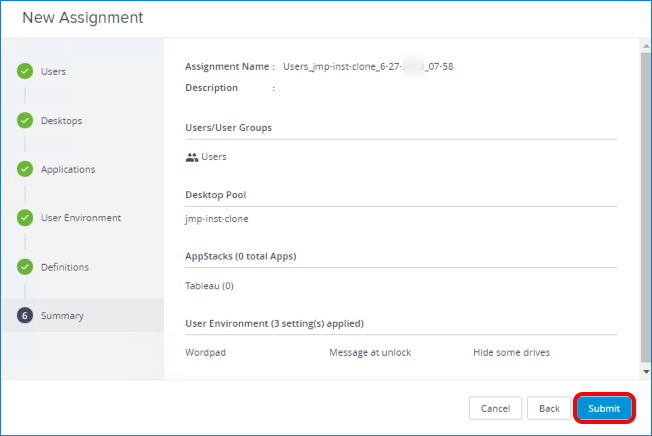 You create a desktop workspace by defining a JMP assignment that includes information about the desktop pool, the App Volumes AppStacks, and User Environment Manager settings. 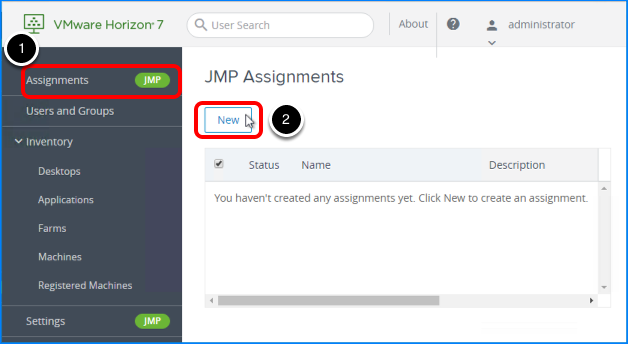 After you submit the JMP assignment, the JMP automation engine communicates with the Connection Server, App Volumes, and User Environment Manager systems to entitle the user to a desktop. 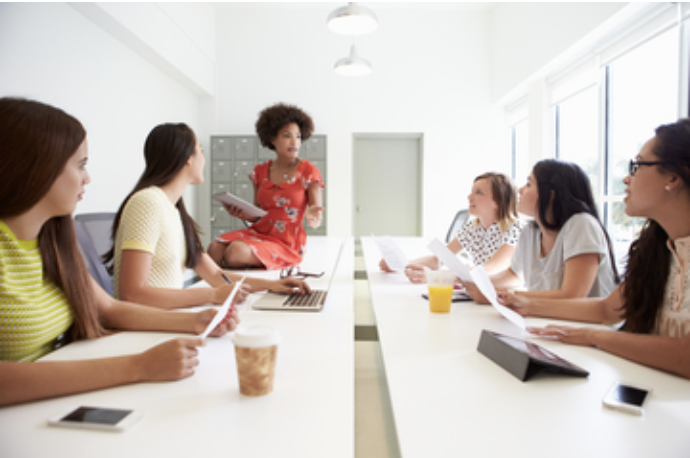 The Quick-Start Tutorial for VMware Horizon JMP Integrated Workflow helps you evaluate JMP Integrated Workflow features by providing a discussion of the product and offering practical exercises. Important: This tutorial is designed for evaluation purposes only, based on using the minimum required resources for a basic deployment, and does not explore all possible features. This evaluation environment should not be used as a template for deploying a production environment. To deploy a production environment, see the VMware Horizon 7 documentation. This tutorial is intended for IT administrators and product evaluators who are familiar with VMware vSphere® and VMware vCenter Server®. Familiarity with networking and storage in a virtual environment, Active Directory, identity management, and directory services is assumed. Knowledge of other technologies, such as VMware Horizon 7 is also helpful. In the early years of VDI, the operating system (OS) for each virtual desktop had to be managed and patched regularly, and applications had to be updated, just as if the VM were a physical machine. In recent years, linked-clone technology sped up VM creation, provisioning, and maintenance, but maintenance windows were still required for refreshing the VM back to its original disk size. The VM also had to go through a lengthy recompose operation to apply OS and application updates. And at regular intervals VMs had to be rebalanced across datastores. Today with JMP, components of a desktop or RDSH server are decoupled and managed independently in a centralized manner, yet reconstituted on demand to deliver a personalized user workspace when needed. For example, because VMs can be cloned in seconds, they no longer need to persist when the user logs out. App Volumes, a container-style technology, can attach applications to a VM when the user logs in. User preferences and settings for each application are applied when the user launches the application. JMP offers an alternative to managing per virtual machine. JMP decouples each aspect of a desktop to allow it to be managed on a per-user or per-group basis. As illustrated in the following figure, application-management containers are managed separately from the desktop OS. Similarly, user data files and OS- and application-specific configurations are decoupled from the OS and kept on separate file shares. 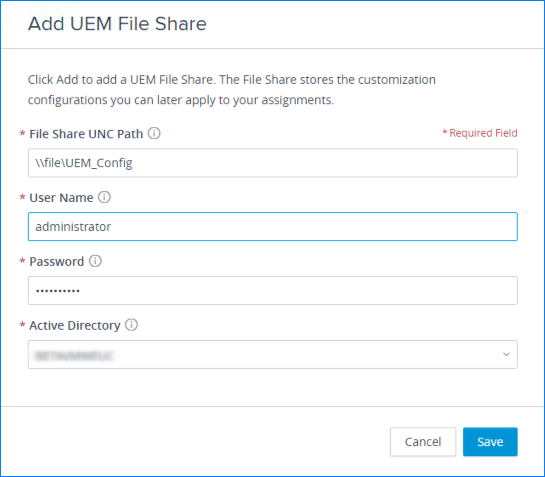 User Environment Manager share A file share that stores user-specific desktop and application settings, making them available across multiple devices, Windows versions, and application instances. Application settings are imported and applied at application launch. 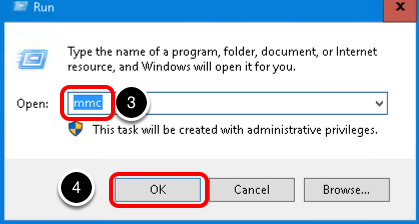 Windows settings (such as the desktop background, desktop screensaver, keyboard settings) are imported at login. When a user quits an application, or logs out of the OS, settings are exported and saved on a file share. User data share A file share that stores personal user data, documents, pictures, and so on that are redirected from specific folders inside the VM. This strategy minimizes the number of files that must be copied to the VM when the user logs in. AppStack A read-only container for one-to-many delivery of IT-managed applications. For virtual desktops, AppStacks are assigned to an Active Directory user or group, and assigned AppStacks are attached to the desktop when a user logs in. Writable volume A one-to-one, user-specific, read-and-write container for user-installed applications or for applications that require a local cache, since a writable volume appears as part of the local C: drive. Instant clone A new type of cloned VM that is created using vSphere vmFork technology to rapidly clone both the memory and the disk of a running parent VM. You use the Horizon Console to access the JMP integrated workflow. With this one user interface, you create an assignment that defines which elements to use from all three products: View in Horizon 7, App Volumes, and User Environment Manager. 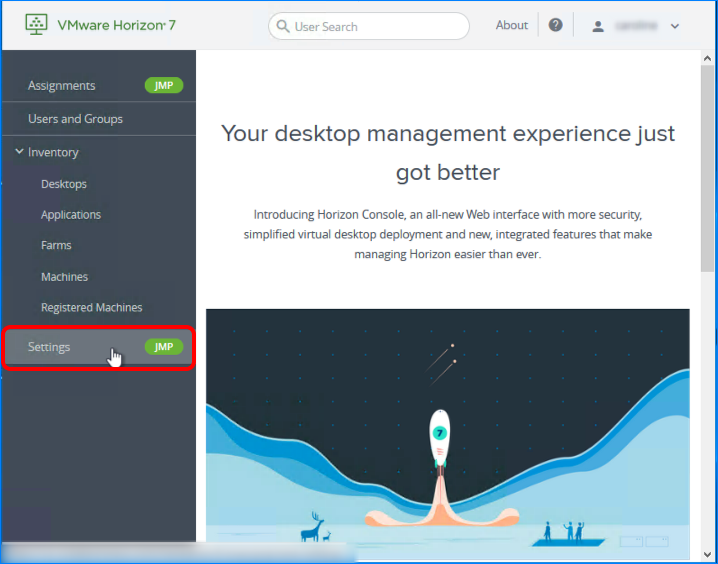 Horizon 7 version 7.5 or later – For instructions for installing and configuring the Connection Server, see Reviewer's Guide for View in VMware Horizon 7: Installation and Configuration. For instructions on creating instant-clone desktop pools, see Reviewers Guide for View in Horizon 7: Instant Clones. 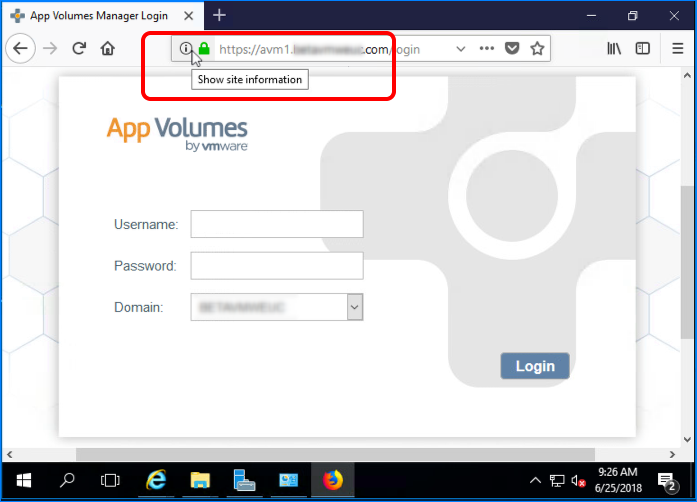 App Volumes 2.14 or later – For instructions for installing and configuring App Volumes Manager, see Reviewer's Guide for VMware App Volumes, and see the VMware App Volumes documentation. User Environment Manager 9.2.1 or later – For instructions for installing and configuring User Environment Manager, see Quick-Start Tutorial for User Environment Manager. 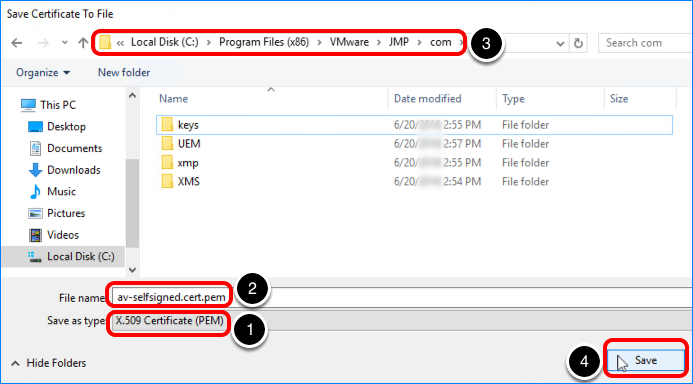 Note: Although you can also integrate JMP with VMware Workspace ONE through VMware Identity Manager, such integration is beyond the scope of the exercises in this tutorial. For more information about this integration, see the VMware Horizon 7 documentation. 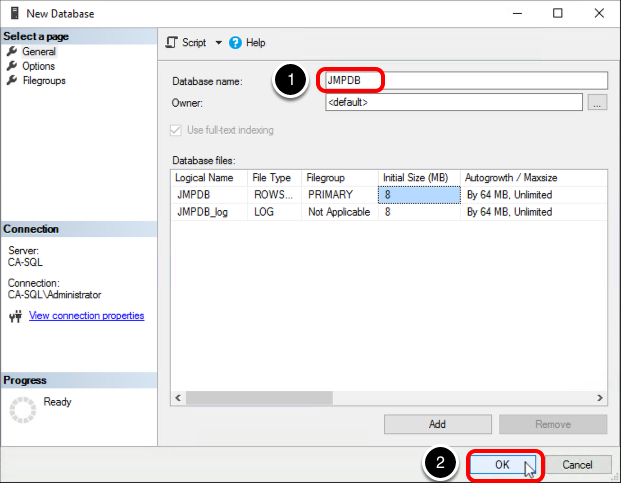 Before you can run the JMP installer, you must create a database and two database logins. 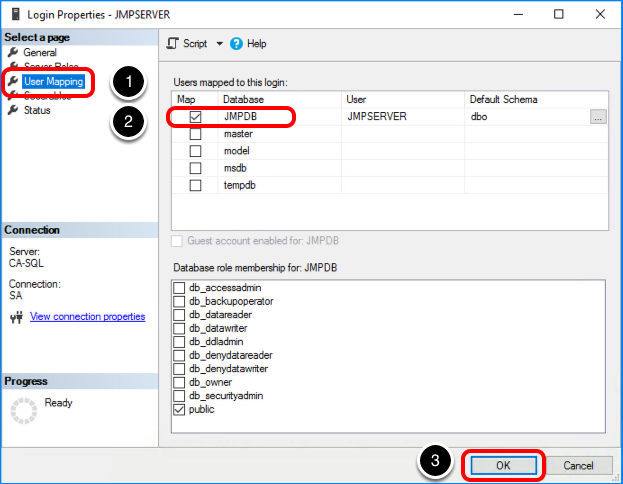 User account – AD credentials for the user account that will be used for installing the JMP server. 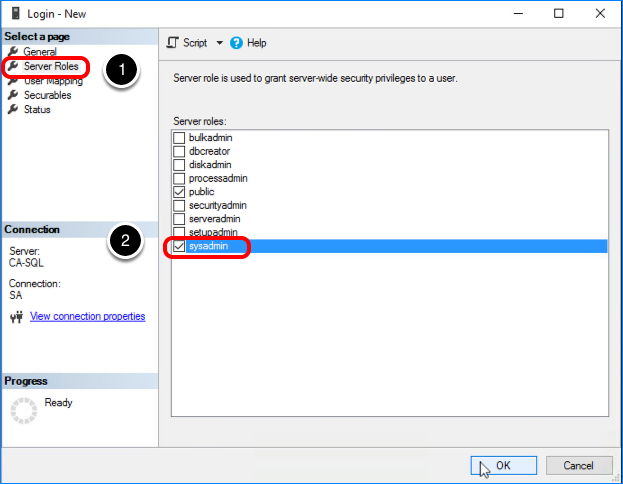 To run the installer, you must use a domain user account with local administrative privileges on the host system of the JMP server VM. 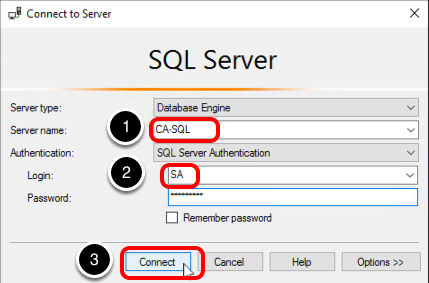 SQL Server instance – This is the database server on which you will create the database for the JMP server. For the example in this exercise, we used Microsoft SQL Server 2016. For a list of all supported databases, see Database Requirements for JMP Server. Select SQL Server instance. By default your Windows login credentials are used, but you are not required to use Windows authentication. 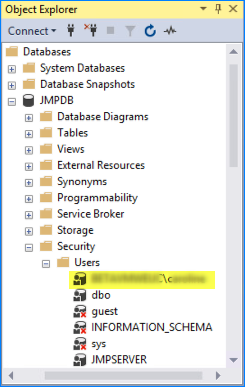 For the database name, enter JMPDB. You must use only ASCII characters. Use the default settings. 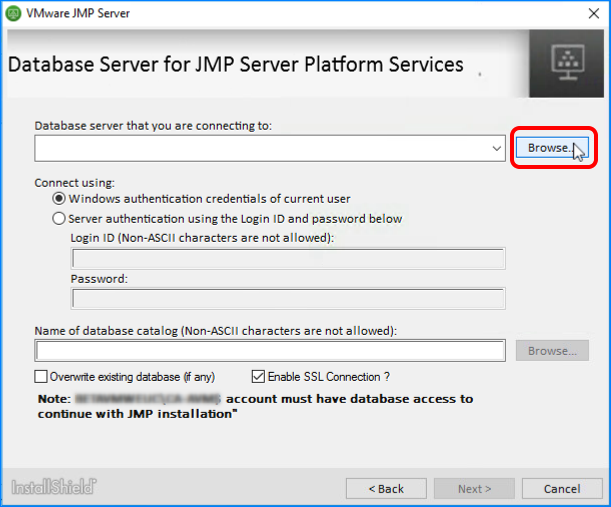 The JMP server installer needs to access the database when it runs. You must create a login for this purpose. Expand the Security folder, and right-click Logins. Enter a login name to use for the JMP server machine, using ASCII characters only; for example, JMPSERVER. 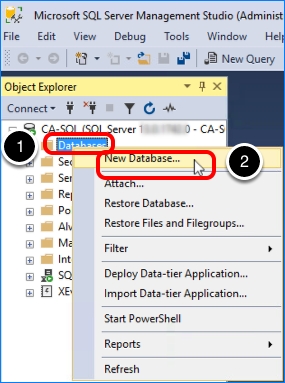 You can leave the default database set to master, or you can select the JMPSERVER database. 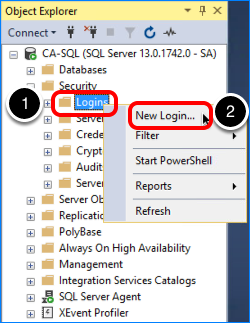 The new login is added under the Security > Logins folder in the Object Explorer pane, and the user is added under the Databases > JMPDB > Security > Users folder. 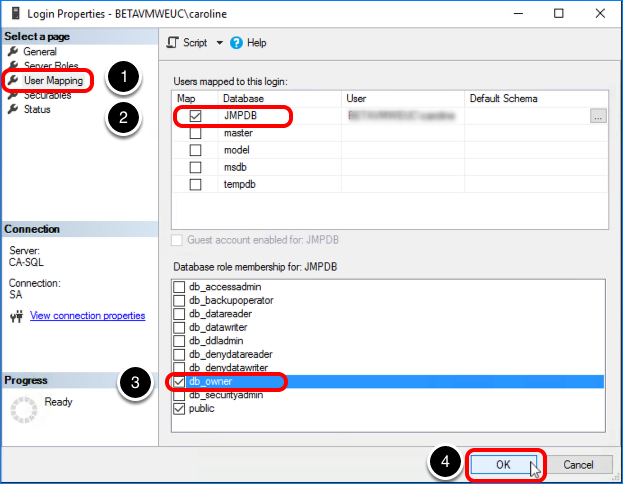 Enter a valid Active Directory user account that you plan to use to install JMP Server. Click Check Names to validate the account name. 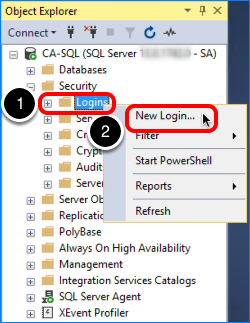 The new login is added under the Logins folder in the Object Explorer pane, and the user is added under the Databases > JMPDB > Security > Users folder. 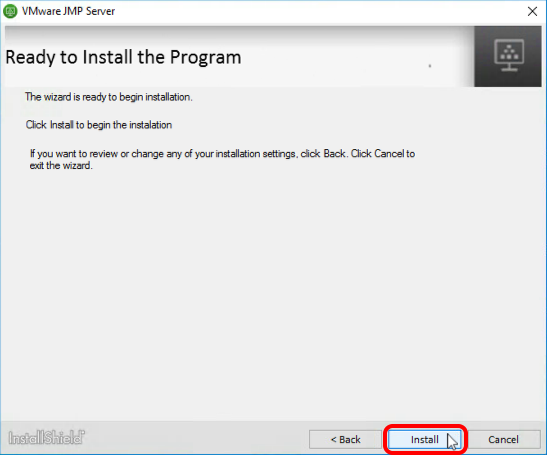 Installing the JMP server is a simple process of running the installation wizard and pointing to the JMP server database you created. Connection Server – The required version is Horizon 7 version 7.5 or later. For installation instructions, see Reviewer's Guide for View in VMware Horizon 7: Installation and Configuration. VMware App Volumes 2.14 or later – For installation instructions, see Reviewer’s Guide for VMware App Volumes. VMware User Environment Manager 9.2.1 or later – For installation instructions, see Quick-Start Tutorial for VMware User Environment Manager. 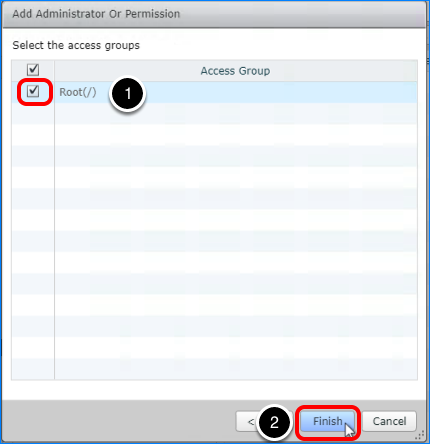 User account – To run the installer, you must use a domain user account with administrative privileges on the host system of the JMP server VM. For this exercise, you will use the user account for which you created a database login during the previous exercise. 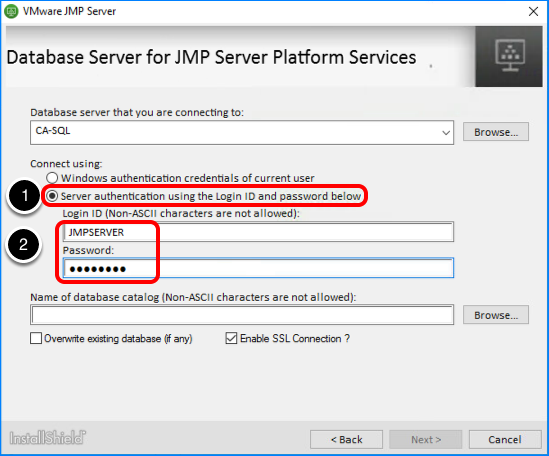 Database – Verify that you have performed all the steps in the exercise Set Up the JMP Server Database, which include creating the database and the various logins required for the JMP server to communicate with the database. 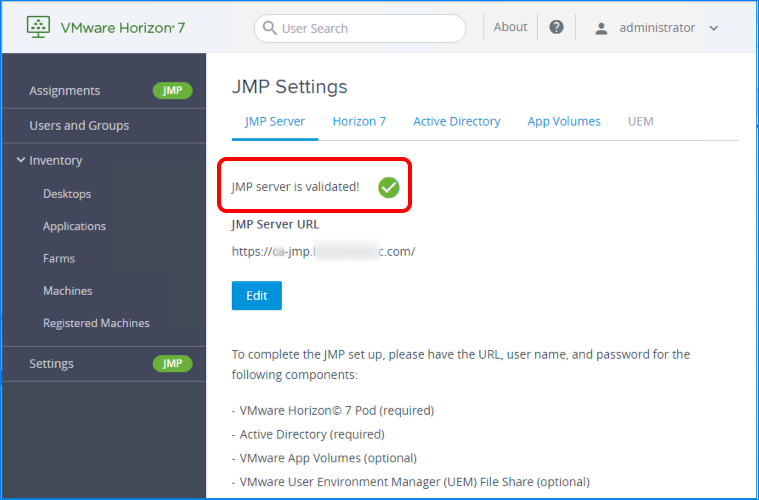 Installer – The JMP Server installer file is included when you download VMware Horizon 7 version 7.5 or later. If necessary, you can download the installer from the Product Evaluation Center or the VMware Downloads page. VM to host the JMP server – Like all server VMs, the JMP server has certain hardware, OS, and network requirements. For the example in this exercise, we used a Windows Server 2016 VM with 4 vCPUs, 4 GB of memory, and 25 GB of storage. For a production environment, see Hardware Requirements for JMP Server and Supported Operating System for JMP Server. For a complete list of system requirements, see System Requirements for JMP Server, in the VMware Horizon JMP Server Installation and Setup Guide. Note: If the VM has McAfee Antivirus installed, add the following files to the McAfee Antivirus exclusion list before you install the JMP server. For this example, we downloaded the installer to a VM hosted on a VMware ESXi server. 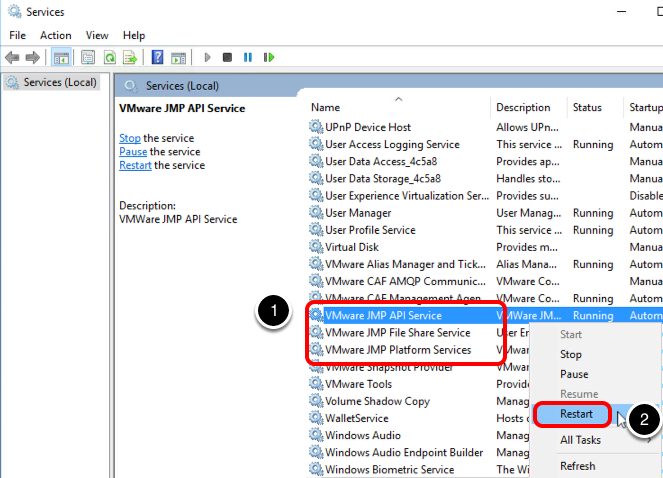 To connect to this VM, called CA-JMP, you would select the VM in the inventory list and select Launch Web Console. 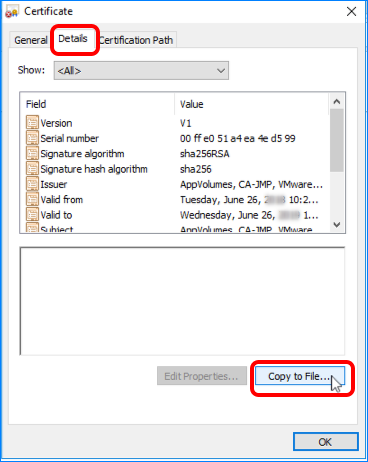 For the example in this exercise, we copied the file to the JMP server system, but you can alternatively copy it to a location accessible to the system. 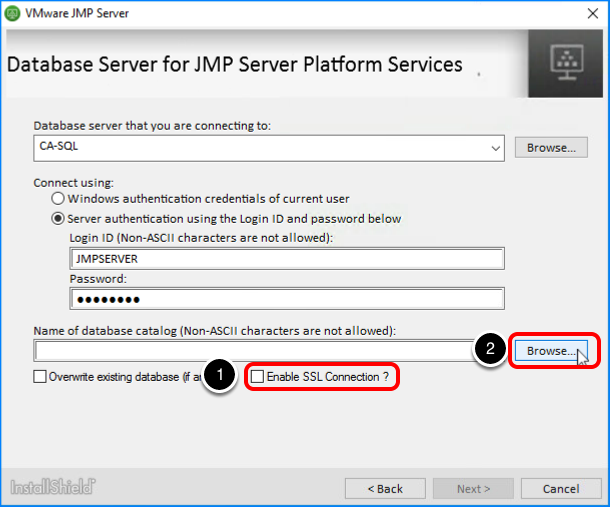 Log in to the JMP server host system as a domain user with administrative privileges on the host system, and double-click the installer file. Follow the prompts until you get to the Allow HTTP Traffic on Port 80? page. The JMP server uses port 443 and, optionally, ports 80, 3000–3004, 888, and 8889. The choice of whether to allow port 80 is up to you. For the purposes of this exercise, and for some POC (proof-of-concept) installations, enabling HTTP traffic on port 80 helps avoid having to troubleshoot issues with encryption. Although you can type in the name of the server, using the Browse button ensures that the server is accessible and avoids typing mistakes. Note: By default, the connection uses Windows authentication. 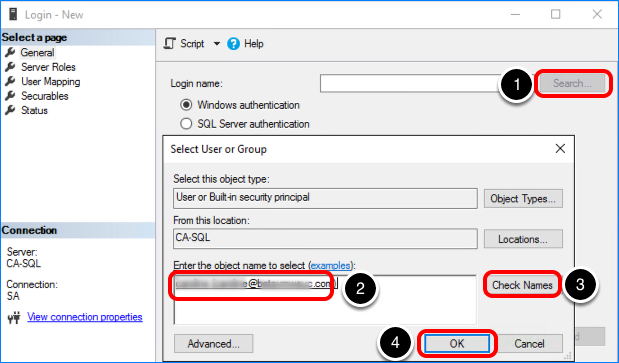 This is correct, assuming you logged in to the system as the same domain user that you used for creating the database login, as described in Set Up the JMP Server Database. 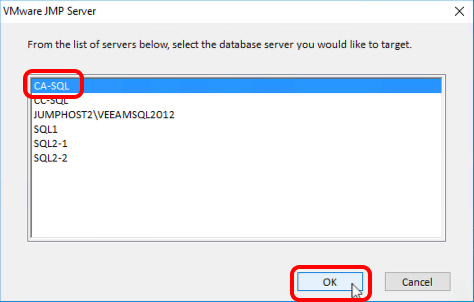 Select the database server you used when completing the exercise Set Up the JMP Server Database, and click OK. Select Server authentication using Login ID and password below. This was the type of authentication used in the exercise Set Up the JMP Server Database. Enter the login ID name (JMPSERVER) and password you used when you created this ID. Click to remove the check mark from the Enable SSL Connection? check box. 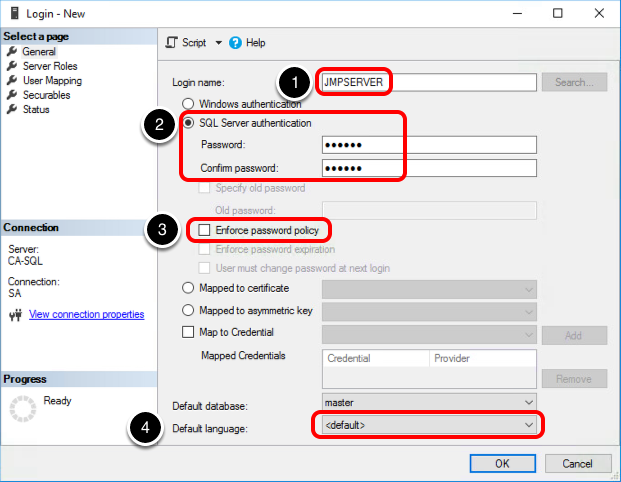 Important: When this check box is selected, the TLS/SSL certificate used in SQL Server must be imported into the Windows local certificate store on the JMP Server host before you run the installer. 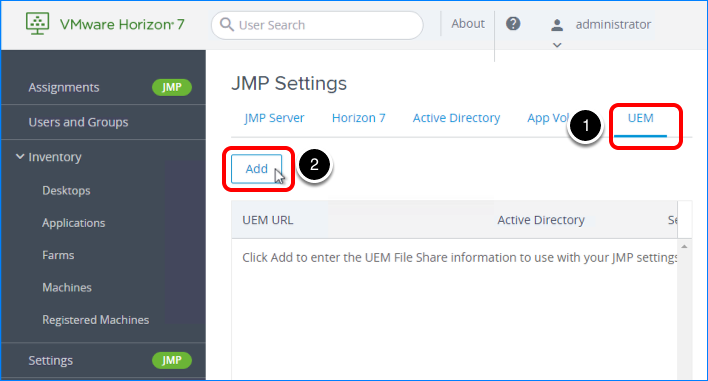 Otherwise, the JMP server installation process fails with the error "Failed to execute uem_migrate.bat file," and when you click OK in the error dialog box, installation is rolled back. In a production environment, for security purposes, you would leave this check box selected, but for this exercise, de-select the check box. Click Browse to select the database from a list. 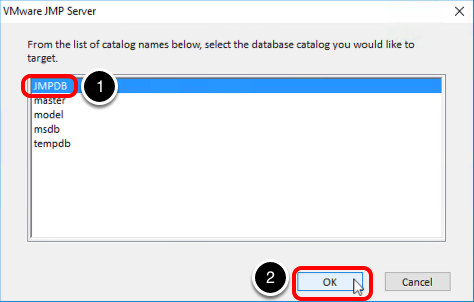 Select the database you created when completing the exercise Set Up the JMP Server Database. Click OK to close the dialog box, and click Next on the wizard page. After installation is complete, the wizard notifies you that installation was successful. Verify that the VMware JMP Server program appears in the list. 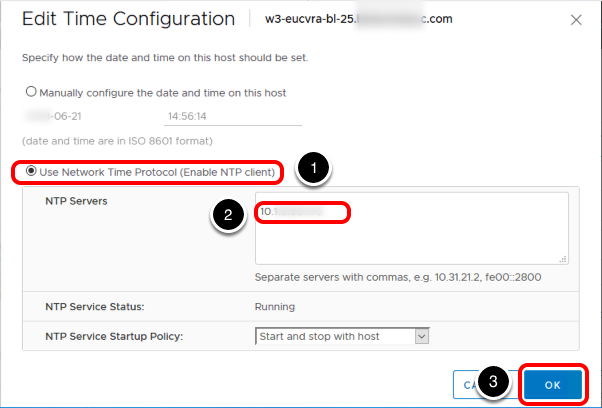 The clock in both the Connection Server and JMP server hosts must be synchronized in order for the authentication process between the two servers to be successful. Important: For the purposes of this quick-start, we assume that you are performing these exercises in a test environment. Changing the time-synchronization configuration of a Connection Server or ESXi host in a test environment does not carry the same risks as changing the configuration of a production environment component. 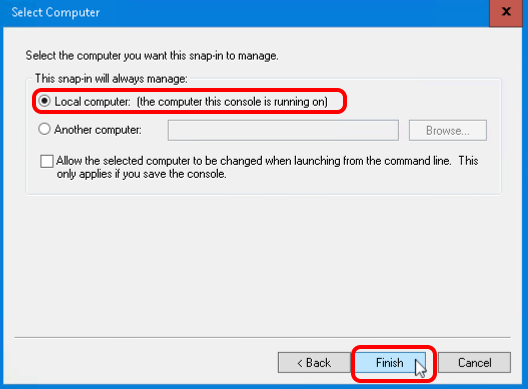 If you are performing this exercise using a production Connection Server or ESXi host, consult with the proper administrators before changing time-synchronization settings. 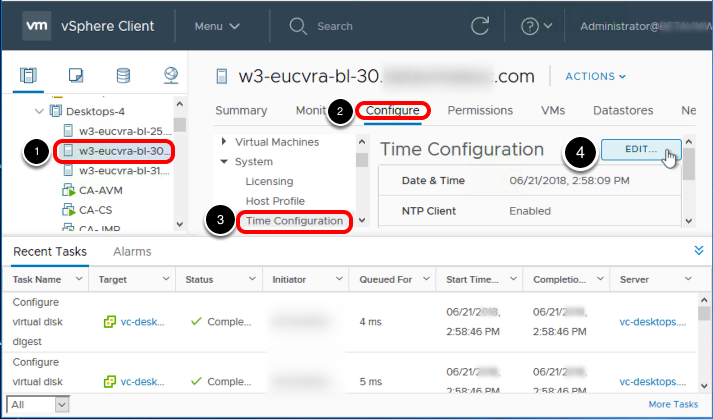 VMware Tools – You will use VMware Tools command-line options to turn on time synchronization with the ESXi host for the Connection Server VM and the JMP server VM. Therefore, VMware Tools must be installed in the VMs. 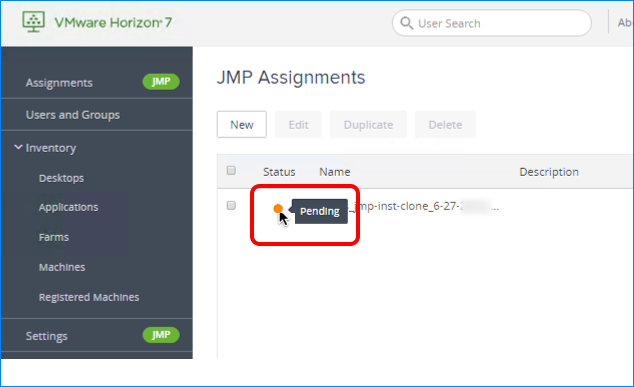 Connection Server version – To use the JMP integrated workflow, the Connection Server version must be Horizon 7 version 7.5 or later. 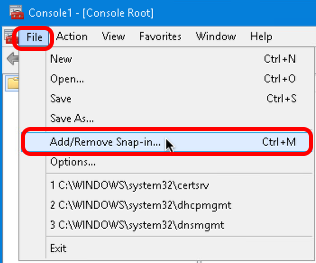 On the Connection Server system, open a command prompt, and change directories to the C:\Program Files\VMware\VMware Tools directory. Repeat these steps on the JMP server system. Both the JMP server and the Connection Server now synchronize time with the ESXi host. In vSphere Client, select the ESXi host for the Connection Server and the JMP server. If you do not know which ESXi host to use, select the VM for the Connection Server or JMP server and use the Summary tab to determine the ESXi host. 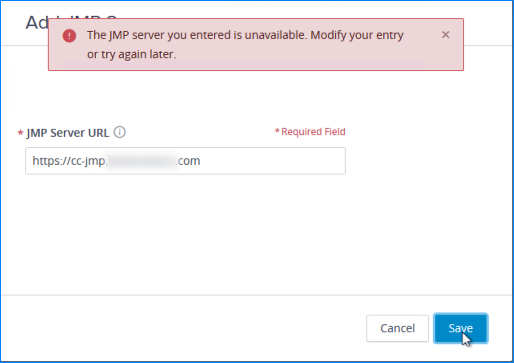 Note: The JMP server might use a different host from the Connection Server. Under the System settings, select Time Configuration. Enter the IP address or fully qualified domain name of one or more NTP servers to synchronize with. 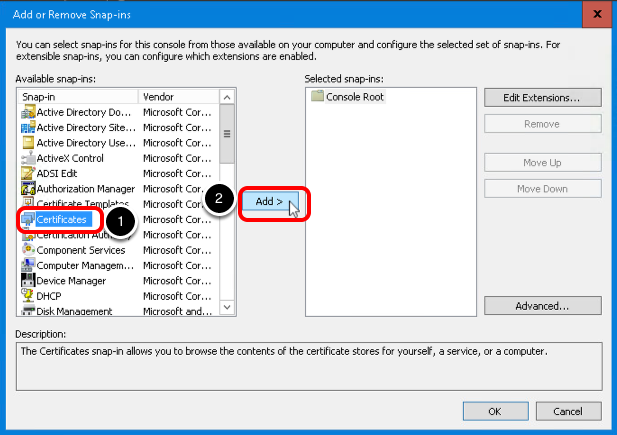 If the JMP server VM and the Connection Server VM use different ESXi hosts, repeat the steps to configure NTP on the other ESXi host. Be sure to use the same NTP server or servers. 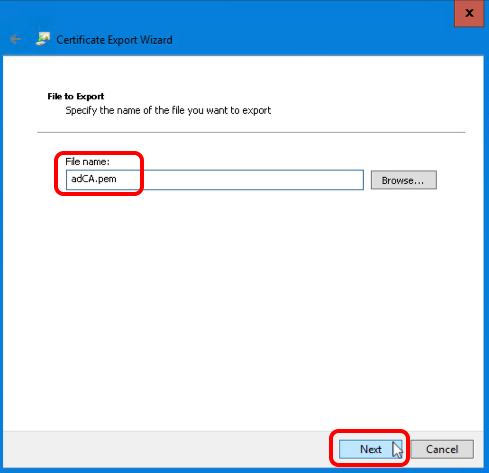 In this exercise, you will export the root CA certificate of the Active Directory domain controller into a certificate file named adCA.pem and place this file in a configuration folder on the JMP server. Log in to the operating system of the Active Directory server, and right-click the Windows Start icon. Because you want to export the root certificate for the server, select Computer account, and click Next. Select Local Computer (the computer this console is running on), and click Finish. 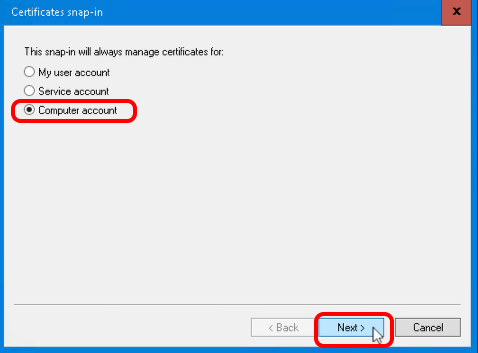 With the Certificates snap-in added to the Selected snap-ins list, click OK. 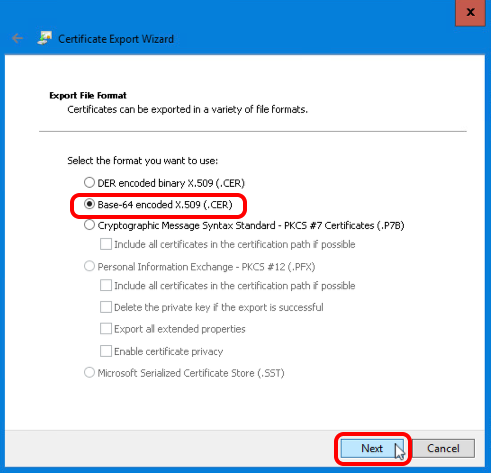 Expand the Certificates > Personal folder, and select the Certificates folder. 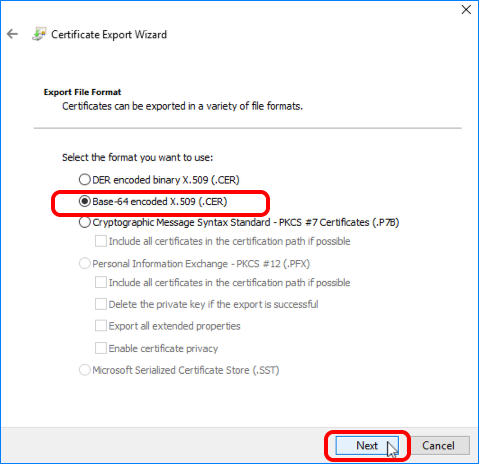 Right-click a certificate name and select Open. You can select any of the certificates in this folder to determine the root certificate. On the Certification Path tab, note the top-most item. The name of the root certificate is displayed. 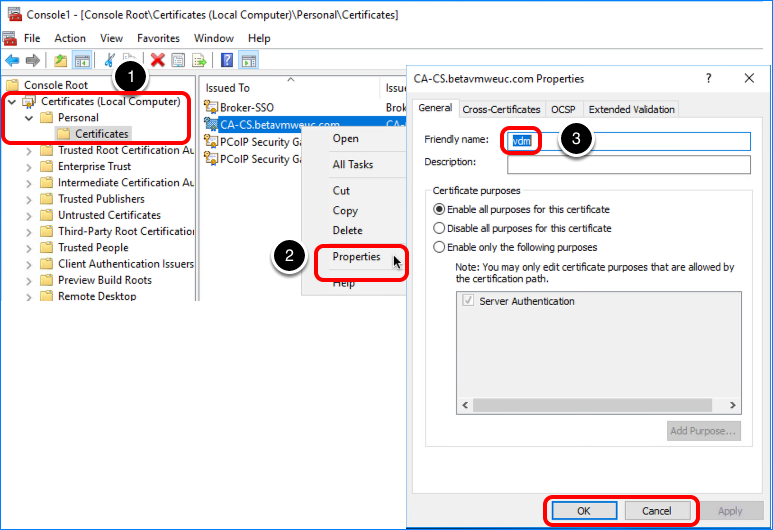 Expand the Trusted Root Certification Authorities folder, and select the Certificates folder. Right-click the certificate name. This is the certificate that was listed on the Certification Path tab in the previous step. Select All Tasks > Export. 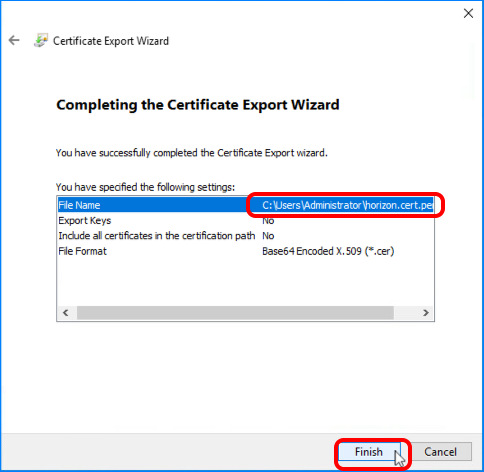 In the Certificate Export Wizard, select Base-64 encoded X.509 (.CER), and click Next. 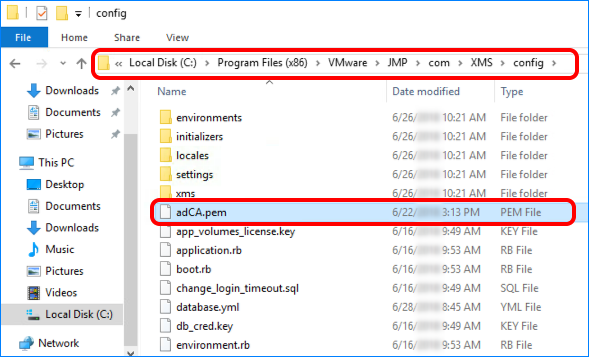 Type the file name adCA.pem, and click Next. Note that the completion page displays the location of the file, and click Finish. Note: To verify that the file uses the .pem extension rather than the .cer extension, you can click the View tab at the top of the window and select the File name extensions check box. For example, if the file name is adCA.cert.pem.cer, rename the file to remove the .cer at the end of the file name. The file must have a .pem file extension. 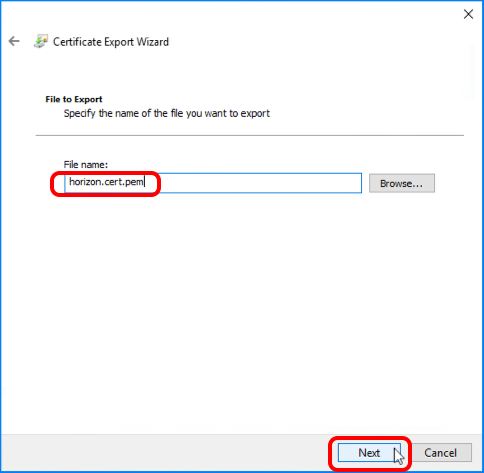 In this exercise, you will export the server certificate of the Connection Server into a certificate file named horizon.cert.pem and place this file in the com folder on the JMP server. 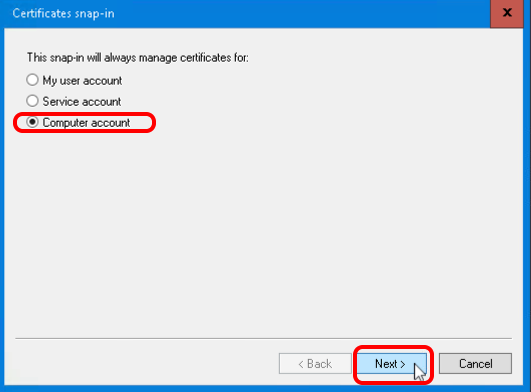 You must have credentials for a user account that has administrator privileges on the Connection Server system and on the JMP server system. 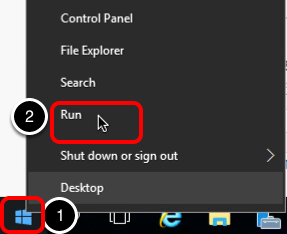 Log in to the operating system of the Connection Server, and right-click the Windows Start icon. Because you want to export the server certificate for the server, select Computer account, and click Next. Right-click the certificate name and select Properties. Verify that the friendly name of the certificate is vdm. If not, find the certificate in that folder that has the friendly name vdm. 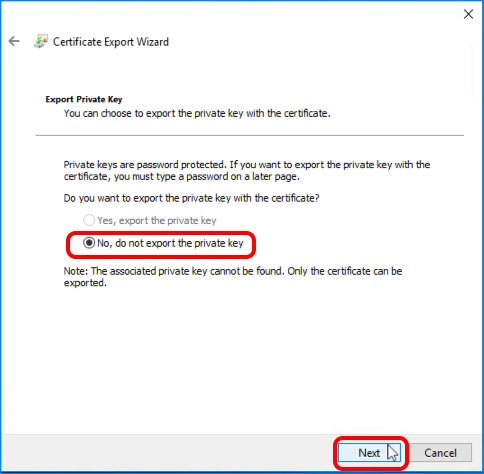 In the Certificate Export Wizard, on the Export Private Key page, select No, do not export the private key, and click Next. 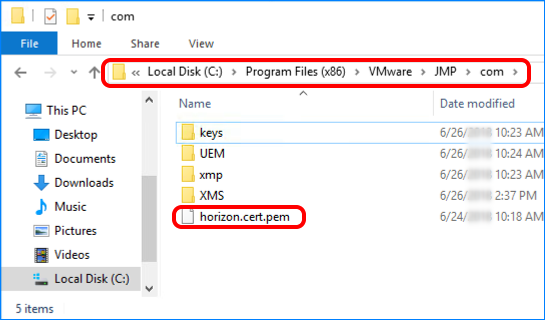 Type the file name horizon.cert.pem, and click Next. 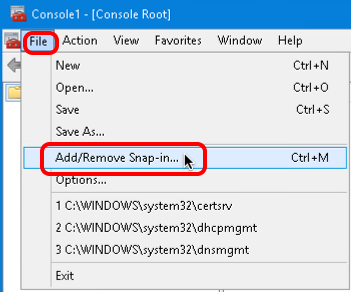 Note: To verify that the file uses the .pem extension rather than the .cer extension, you can click the View tab at the top of the window and select the File name extensions check box. For example, if the file name is horizon.cert.pem.cer, rename the file to remove the .cer at the end of the file name. The file must have a .pem file extension. 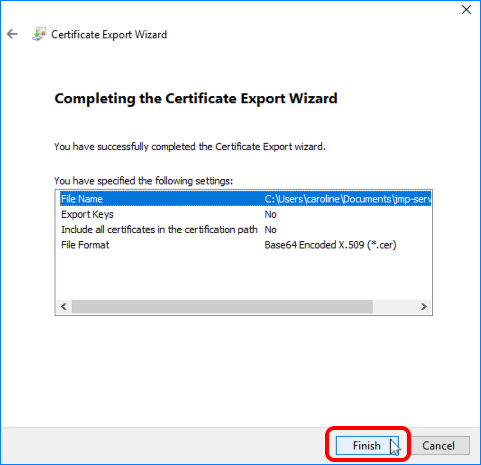 In this exercise, you will export the self-signed certificate of the App Volumes Manager instance into a certificate file named av-selfsigned.cert.pem and place this file in the com folder on the JMP server. App Volumes Manager is installed and set up. For instructions for installing and configuring App Volumes Manager, see Reviewer's Guide for VMware App Volumes, and see the VMware App Volumes documentation. App Volumes 2.14 or later is required. 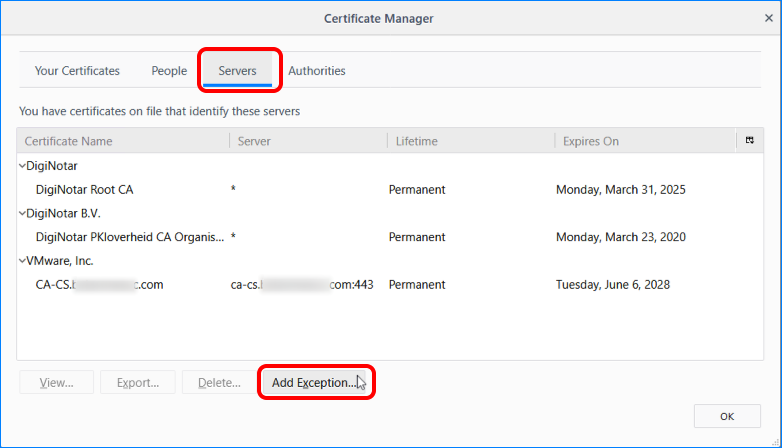 To save the certificate file to the correct location, you must have credentials for a user account that has administrator privileges on the JMP server system. 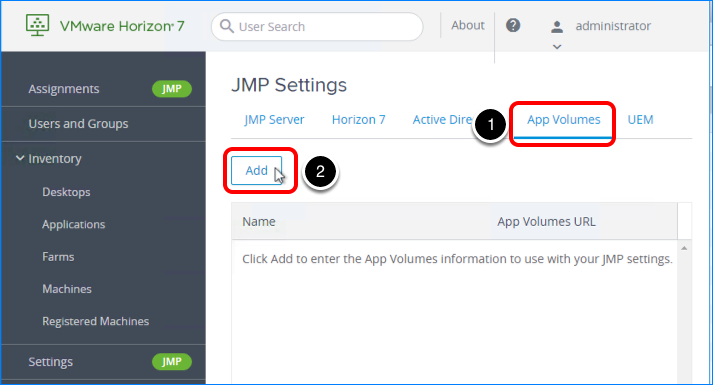 Log in to the JMP server system as an administrator, open a browser and type in the URL to the App Volumes Manager host; for example, https://<app_vol_mgr_server.mycompany.com>. For the example in this exercise, we used a Firefox browser. In the production environment, this URL might point to a load balancer fronting two App Volumes Managers. Click the Show Site Information icon to access the certificate information. On the Details tab, click Export. 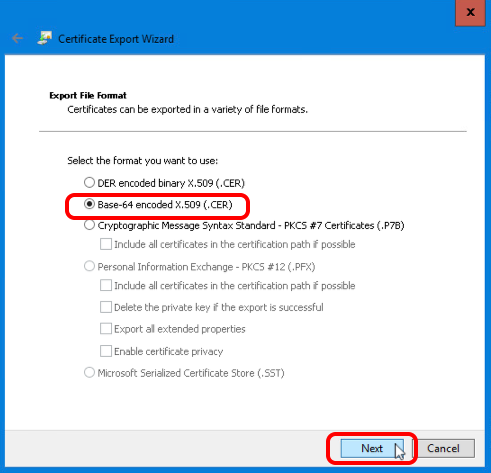 For Save as type, select a PEM-formated certificate type. For File name, type av-selfsigned.cert.pem. For the folder on the local drive, navigate to C:\Program Files (x86)\VMware\JMP\com. To open the Services applet, right-click the Start button, and select Run. After you have installed the JMP server and placed the certificate files from the various servers in the correct location on the JMP server, you are ready to configure settings for the JMP integrated workflow. Administrator account – This is a domain account for the Administrator user (<domain-name>\Administrator). You will add this user to Horizon Administrator. 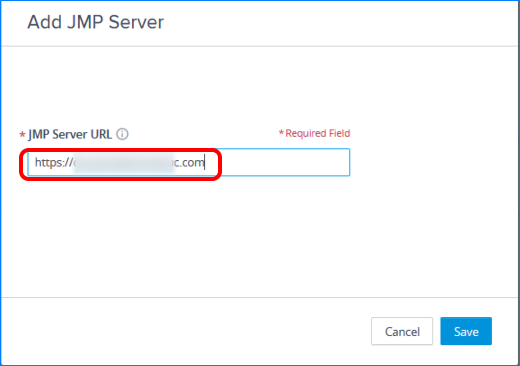 JMP server URL – Use the fully qualified domain name of the JMP server machine. 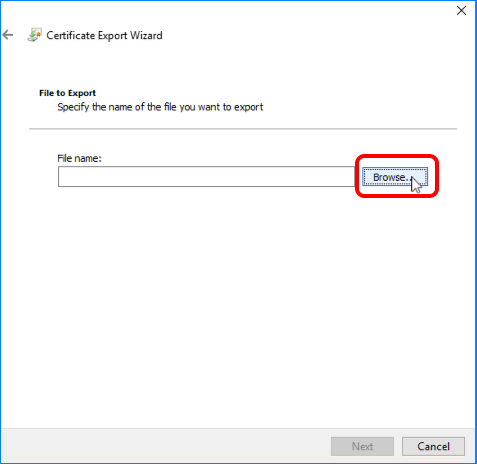 Connection Server certificate – This certificate must be exported in the correct format and placed on the JMP server machine in the correct location. 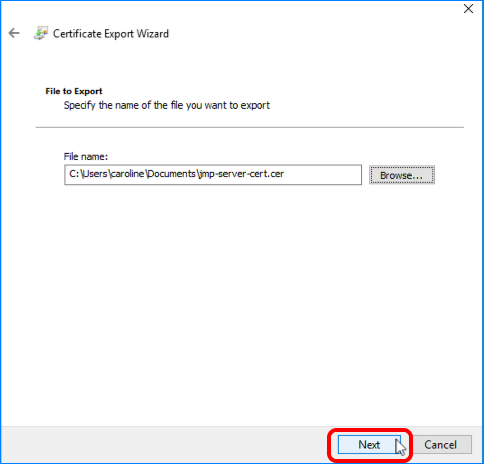 See Place the Certificate for Connection Server in the JMP com Folder. 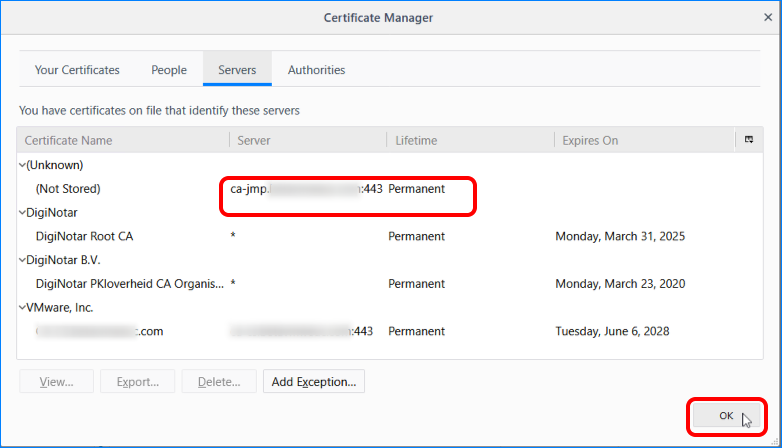 Obtain a CA-signed TLS certificate and replace the default TLS certificate installed by the JMP Server installer. See Replace the Default TLS Certificate. Configure the browser on the computer you are using for the Horizon Console to accept the default certificate. 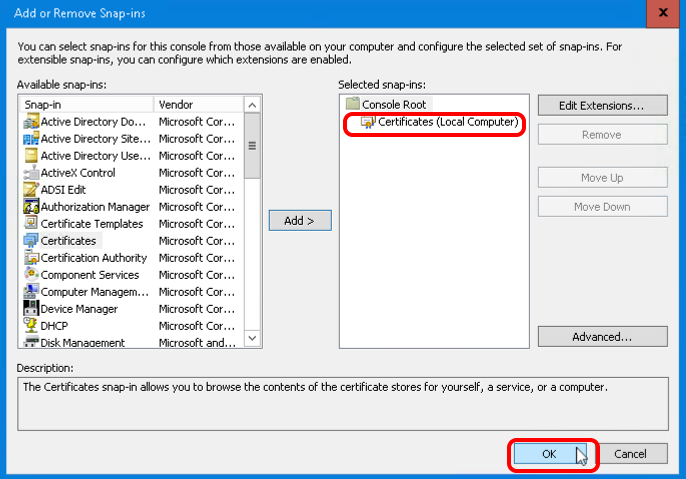 See Configure the Browser to Accept the Default JMP Server Certificate. If you do not use either of these options, when you attempt to add the JMP server, you might get the following error message. 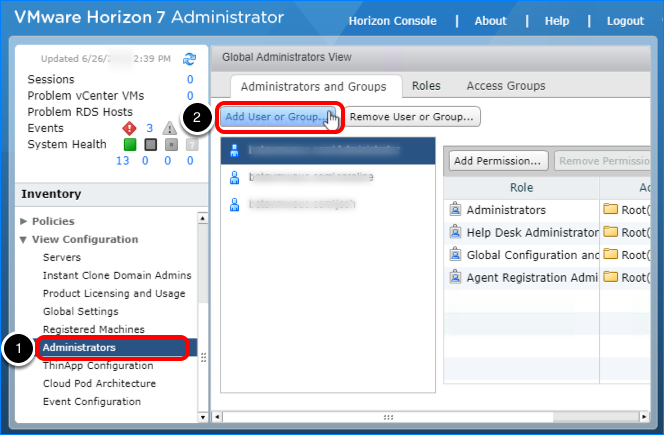 Log in to Horizon Administrator and navigate to View Configuration > Administrators. In the Add Administrator or Permission dialog box, click Add. In the Find User or Group dialog box, select the domain for the Connection Server and JMP server. In the Name/User name text box, enter Administrator. Select the domain Administrator user in the list. On the Select administrators or groups page, click Next. On the Select a role page, select Administrators. Select the check box for Root ( / ). 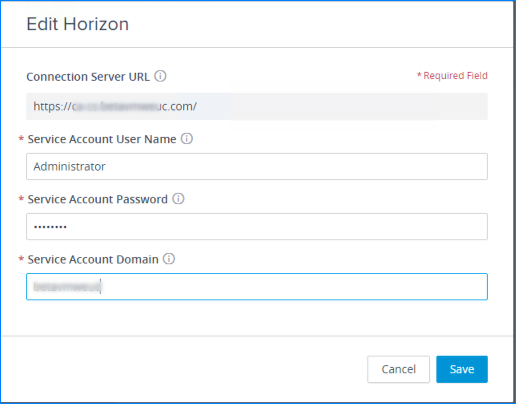 The domain Administrator account now has full Horizon Administrator permissions. 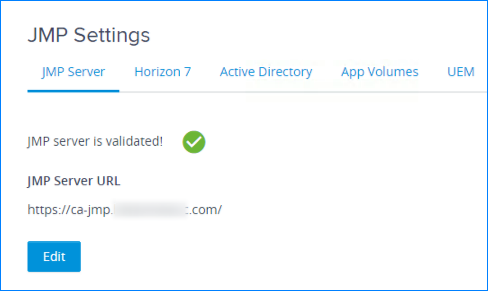 Log in to the Horizon Console as the <domain-name>\Administrator (not as BUILTIN\Administrator), and click Settings. This <domain-name>\Administrator user is the user you just added in the previous steps. On the JMP Server tab, click Add JMP Server. 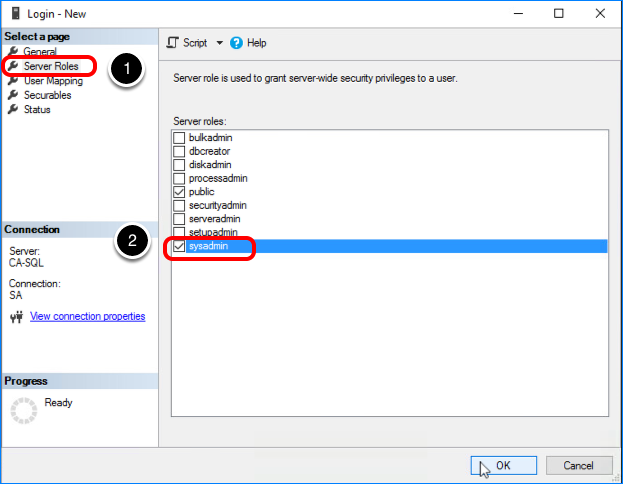 In Horizon Administrator, you have added the <Domain>\Administrator user and given that user the Administrators role at the root level of Horizon Administrator. 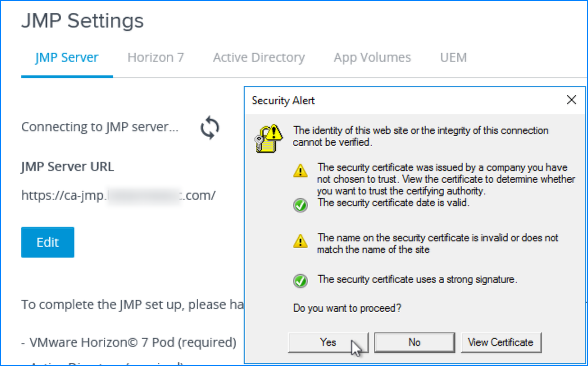 You have exported the Connection Server certificate with the friendly name vdm to a base-64-encoded .pem file and placed it in the following location on the JMP server: C:\Program Files (x86)\VMware\JMP\com\horizon.cert.pem, as described in Place the Certificate for Connection Server in the JMP com Folder. 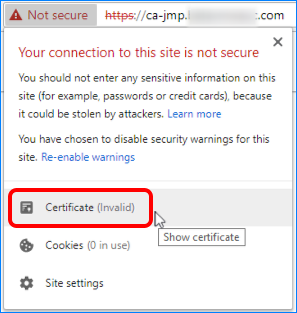 You have either installed a CA-signed TLS certificate on the JMP server, or you have configured your browser to accept the default self-signed certificate. See Configure the Browser to Accept the Default JMP Server Certificate. If all goes well, the URL is validated. If you do not use a CA-signed TLS certificate for the JMP server, your browser most likely will not recognize the default TLS certificate, and when you attempt to use the Horizon Console to add the JMP server, you see the following error message. 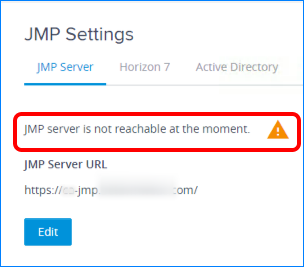 After you succeed in adding the JMP server, if you attempt to use Horizon Console in a different browser or a browser on another computer, you might see the following error message. Browser features and options can change as new versions are released. This procedure uses Firefox 60.0.2. 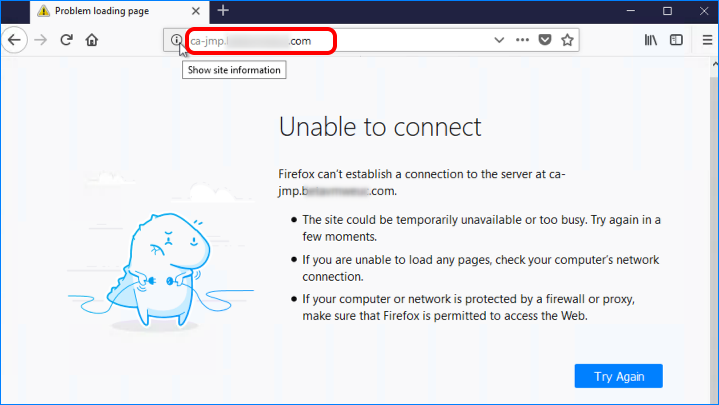 As you can see, the browser cannot connect to the JMP server. Click the menu button icon. Click Privacy & Security in the list of settings. Scroll down to the Security section, and click View Certificates. Enter the URL for the JMP server. Select the Permanently store this exception check box. 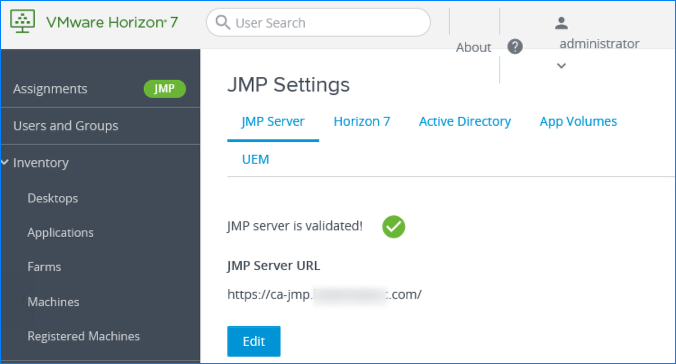 On the Servers tab, verify that the JMP server is listed, and click OK.
You can now go back to the JMP Settings page in the Horizon Console. When you refresh your browser, the JMP server is validated. Browser features and options can change as new versions are released. This procedure uses Google Chrome 67.0.3396.99. 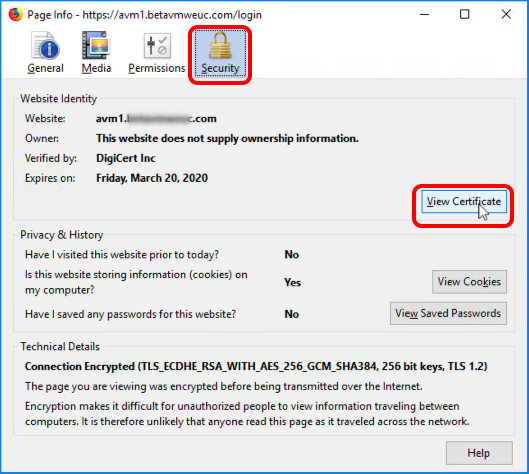 To view information about the self-signed certificate, click View site information. 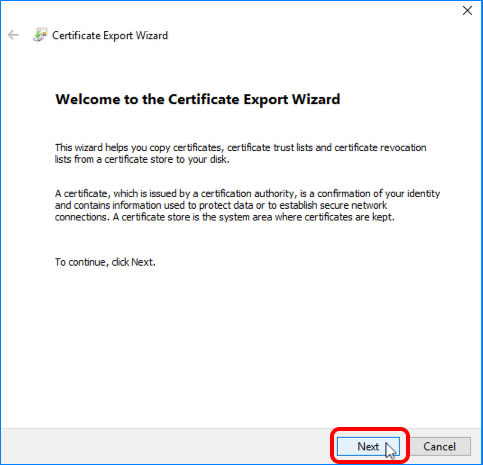 To open the Certificate dialog box, click Certificate. Select Base-64 encoded X.509 (.CER), and click Next. Name the file, and click Save. You can save the file in any location on your computer. The certificate file is saved with a .cer extension, as shown in the following screen shot. You do not need to install the certificate. 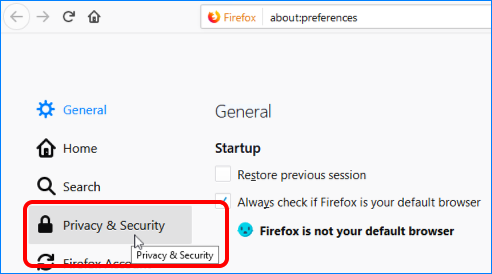 Browser features and options can change as new versions are released. This procedure uses Internet Explorer 11.2312.14393.0. 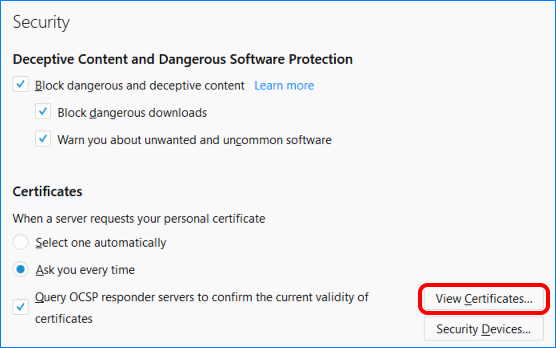 In order to avoid responding to a large number of security alerts, saying that content has been blocked, you can use Windows Server Manager to disable IE enhanced security configuration. 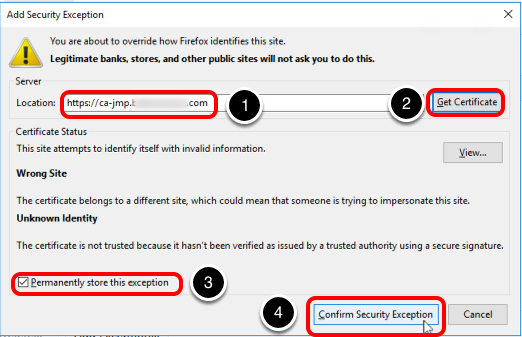 See How to Disable Internet Explorer Enhanced Security Configuration. 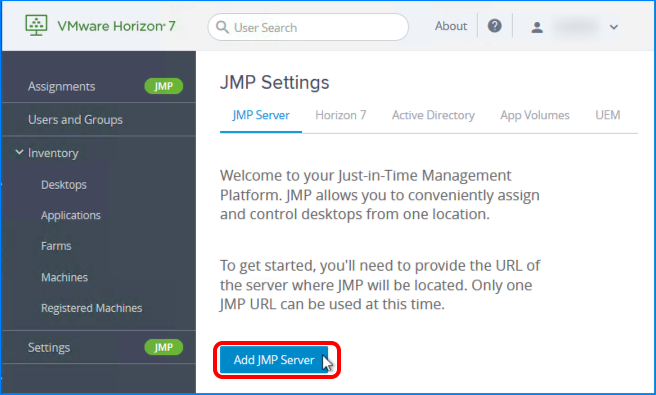 Log in to the Horizon Console, and click Settings for the JMP server. Click Yes when the Security Alert dialog box prompts you. The JMP server is validated. In this exercise, you will add the URLs and credentials for accessing the servers for the components of the JMP integrated workflow, which includes the Connection Server, the Active Directory server, the App Volumes Manager server, and the User Environment Manager Configuration Share file server. 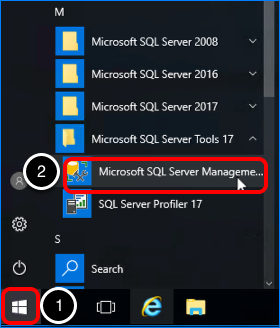 Note: The steps for configuring the App Volumes Manager settings and the User Environment Manager configuration share settings are optional. When creating JMP assignments, you are not required to use these components, but later exercises in this quick-start tutorial do use these components. 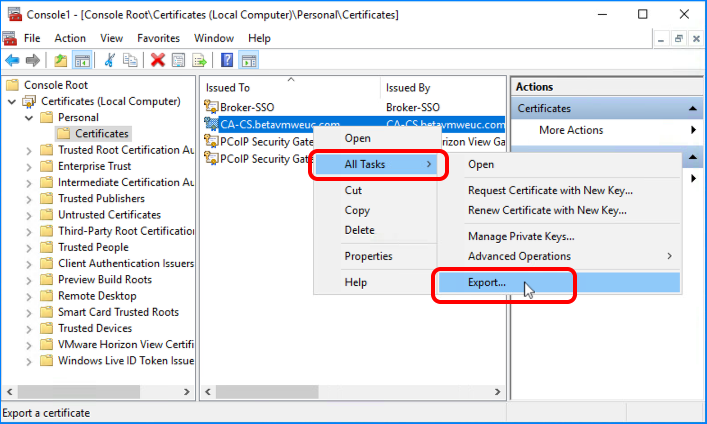 Security certificates for the Active Directory and App Volumes machines – You can use CA-signed certificates or the default self-signed certificates. 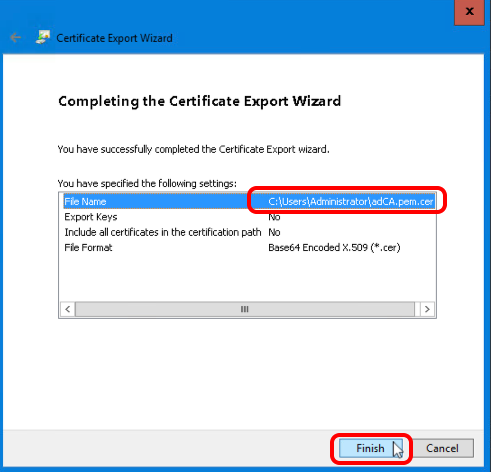 These certificates must be exported in the correct format and placed on the JMP server machine in the correct location. 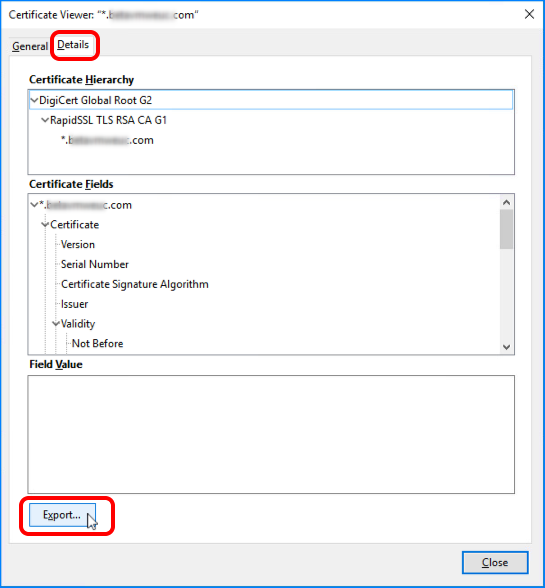 See Place the Root Certificate from the AD Server in the JMP Configuration Folder and Place the Certificate for App Volumes Server in the JMP com Folder. Server information for the JMP components – Use the following table to organize the required information about the various servers involved in the JMP integrated workflow. Tip: The user (service) accounts for each of the components require the administrator-level role for that component. To simplify your setup in a test environment, you could create one account, with the user name Administrator, and use that account for all the server components. You could then use the same credentials for all four of the components. 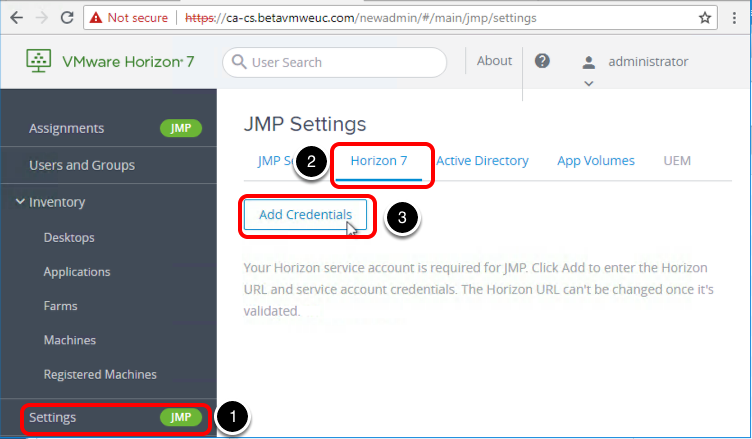 Horizon 7 service account credentials User name and password for a user with the Administrators role in the root level in Horizon Administrator. For this exercise, we will use the domain Administrator user you added when you added the JMP server. Active Directory NETBIOS Name The same NETBIOS domain name as was used for the Service Account Domain. You will select this name from a drop-down list. Active Directory Protocol The protocol used by your Active Directory. For the example in this exercise, our lab was set up to use LDAP (non-secure). For a production environment, the protocol is usually LDAP over TLS. Active Directory Bind User Name and Bind Password Most likely, these are the credentials for the administrator user. 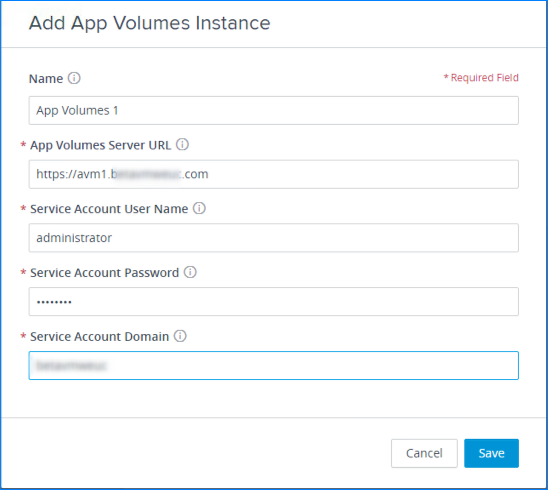 App Volumes service account credentials User name and password for a user with the Administrators role in App Volumes Manager. User Environment Manager User Name and Password User name and password for a User Environment Manager administrator account to connect to the User Environment Manager configuration share. Active Directory domain for User Environment Manager The NETBIOS domain name for the User Environment Manager user account. You will select this name from a drop-down list. Log in to the Horizon Console, and click Settings. Click the Horizon 7 tab. Add the information you gathered as part of Prerequisites for Adding the Other Servers to JMP Settings. The Connection Server URL is already populated. Add the information you gathered as part of Prerequisites for Adding the Other Servers to JMP Settings. 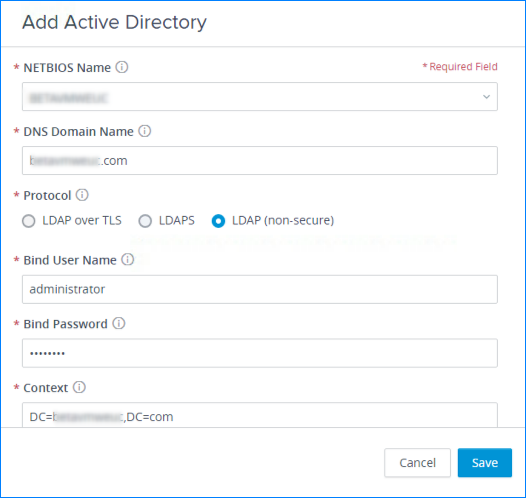 After you select the domain from the NETBIOS Name list, the DNS Domain Name text box and the Context text box are automatically populated. Click the App Volumes tab. Add the information you gathered as part of Prerequisites for Adding the Other Servers to JMP Settings. 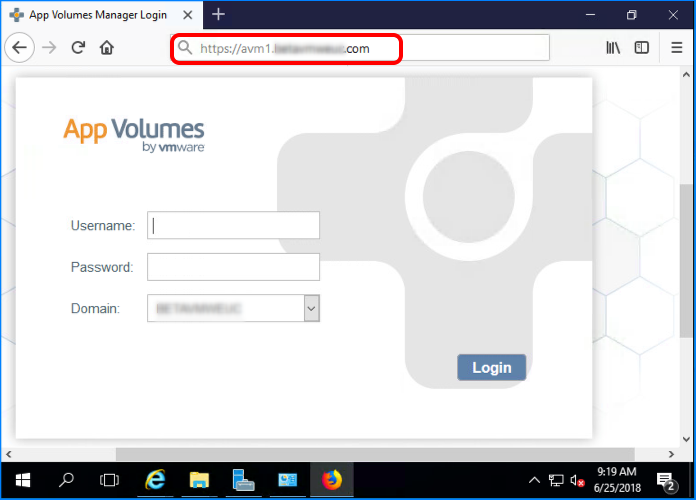 If you use a load balancer in front of two App Volumes Managers, enter the URL for the load balancer in the App Volumes Server URL text box. 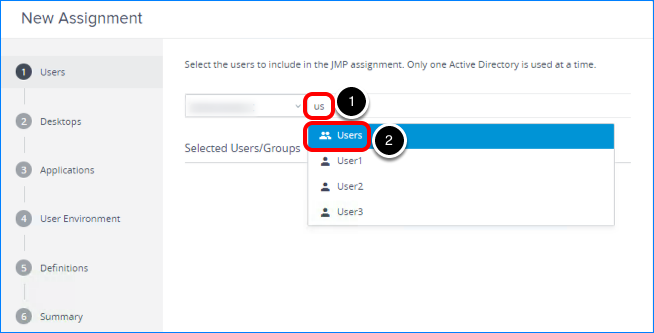 Add the information you gathered as part of Prerequisites for Adding the Other Servers to JMP Settings. You are now ready to create a JMP assignment. If you ever need to change any of the settings you just configured in this exercise, see Managing JMP Settings. 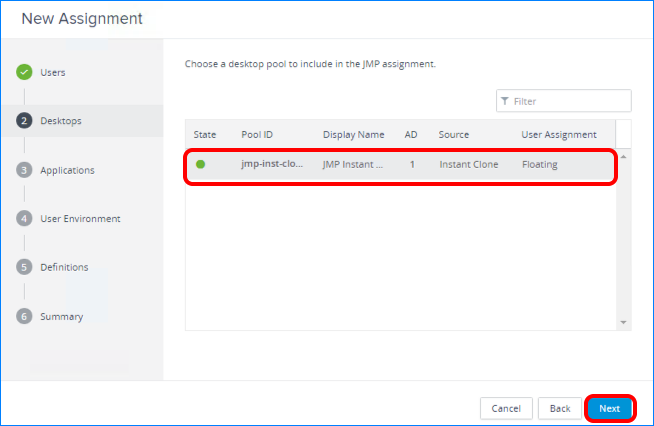 In this exercise, you select the end users, instant-clone desktop pool, App Volumes AppStacks, and User Environment Manager settings to define a JMP assignment. If you have not set up App Volumes or User Environment Manager, you can still do this exercise and skip those components. 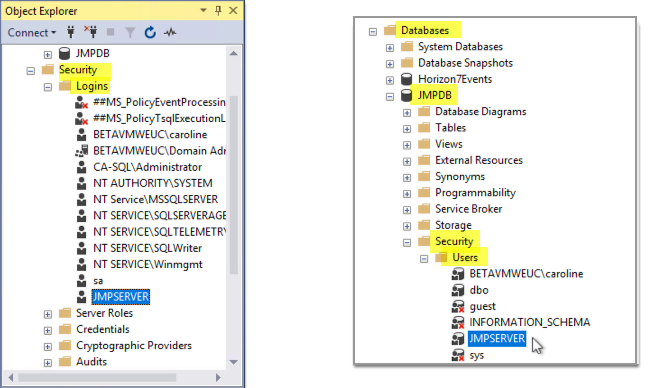 User or user group – You must have set up users and user groups in Active Directory. As part of this exercise, you will enter the first two letters of the user or group name. 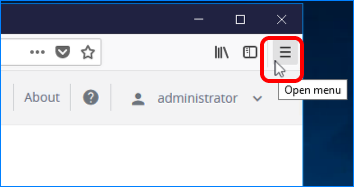 Instant-clone desktop pool – You must have created an instant-clone desktop pool using Horizon Administrator or the Horizon Console. For instructions, see Creating Instant-Clone Desktop Pools. App Volumes AppStacks – If you plan to select applications as part of the JMP integrated workflow, you must have created AppStacks that contain the applications you want to deploy and manage. For instructions, see Reviewer's Guide for VMware App Volumes. 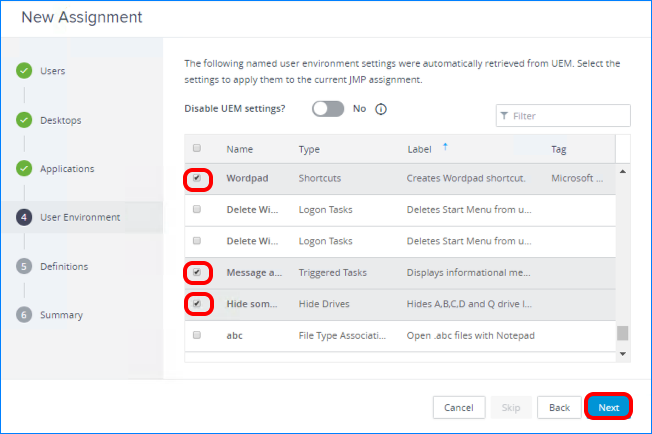 User Environment Manager settings – If you plan to apply granular control policies as part of the JMP integrated workflow, you must have created settings in User Environment Manager. For instructions, see Quick-Start Tutorial for User Environment Manager. 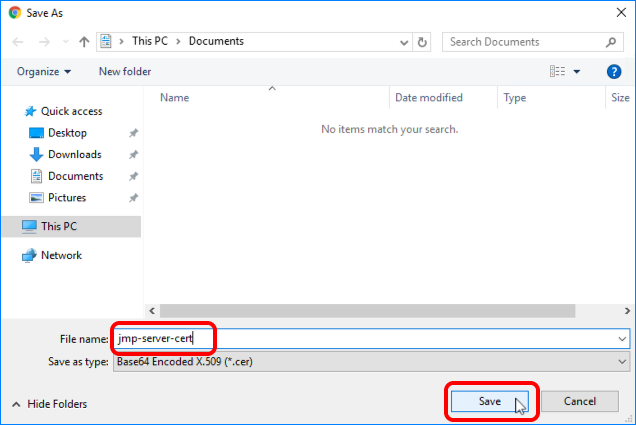 JMP server – You must have installed the JMP server and configured JMP settings by completing the previous exercises in this quick-start guide. The following topic, Administering JMP Assignments, summarizes the JMP server prerequisites. Log in to the Horizon Console, and click Assignments. Type the first two letters of a user or group that you want to assign the desktop workspace to. The domain is already selected. Select the user or group from the list of search results, and click Next. Select the desktop pool in the table, and click Next. Select one or more check boxes next to the applications you want to deploy, and click Next. Note: If you are not using App Volumes or did not configure an App Volumes Manager server, you can click Skip. Select one or more settings to apply, and click Next. Note which settings you select so that you will be able to verify later whether they have been applied when the user logs in to their desktop. Important: With Disable UEM Settings? 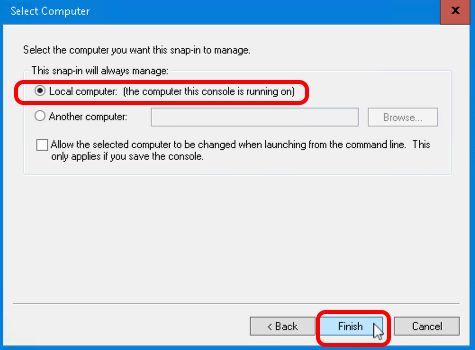 set to No, clicking Skip means that all the User Environment Manager settings are going to be applied to the virtual desktop workspaces in this JMP assignment. If you do not want all the settings applied, be sure to select the ones that you do want applied. Use the default assignment name (as shown in the screen shot), or enter a different name. 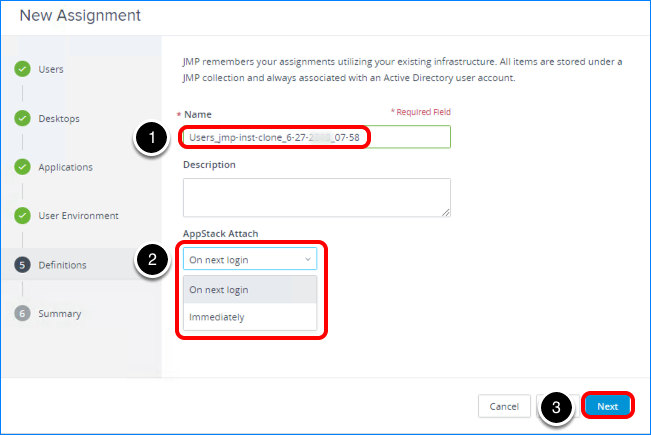 Select whether to attach the AppStacks immediately or at the next login (recommended). Review the assignment, and click Submit. Hover your pointer over the status indicator. While the new JMP assignment is queued for storage in the JMP database, the status is Pending. After the assignment is added to the database, the status changes to Success. This Quick-Start Tutorial introduced you to the JMP integrated workflow, available from the Horizon Console, and enabled you to set up a proof-of-concept environment through practical exercises. Jim Yanik is a Senior Manager of End-User-Computing (EUC) Technical Marketing at VMware.